Please follow Axel on Twitter to receive updates on the economy, currencies, and global dynamics directly from Axel Merk. Stay informed on issues that may affect your investments with market commentary from Axel Merk and the Merk team. Introducing the Sustainable Wealth Lifestyle. Sustainable wealth is a matter of understanding how the greater economic universe works, how that will affect your finances, and how to manage those finances to seek a sustained, financially secure future. Many individuals have gone down the wrong path, risking future financial security to satisfy present wants, sometimes even disregarding their future finances altogether. But there’s a greater issue here, one you’ve probably already heard about: as a nation we’re mortgaging our future, one printed dollar at a time, to give ourselves a comfortable present. That’s a problem, because it compromises all of our abilities to provide for our own future needs. “If I had to pick a single one from the plethora of publications trying to come up with solutions to the present-day investor’s predicament, I would not hesitate to reach for Axel’s book. He manages to encapsulate much of the no-nonsense but common-sense-laden wisdom that is so sorely needed in today’s post-crisis environment, in this little treasure. Indeed, we may not find ourselves to be in a post-crisis environment today, had we all followed the precepts outlined in this captivating read. Sustainable Wealth is available for order now. The information provided does not constitute a solicitation or an offer to buy or sell any investment product, nor provide investment advice. 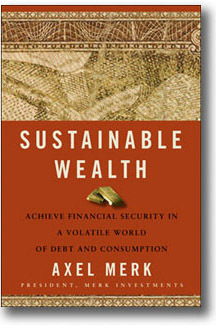 SustainableWealth is a trademark of Merk Investments LLC. The opinions expressed are subject to change and do not necessarily reflect the opinions of Merk Investments.